Located at a distance of 25 km. from the district head quarter, Cuttackon the Cuttack- Kendrapara State Highway, Salipur stands against the backdropof panoramic, sylvan Chitrotpala, just about a kilometer away from the SalipurBazaar. 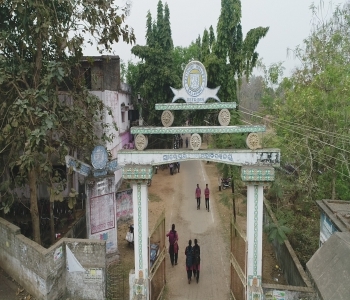 Eminent persons from various walks of life who have made significantcontributions towards the advancement of Orissa have hailed from and aroundthis area and nourished and patronised this college from its fledgling state till itattained a healthy adulthood. The long felt need for establishing a collegecatering to the demands of the people of a vast area of the Cuttack district wasfulfilled in 1963. A College committee comprising active, enthusiastic personsof status in the locality entrusted with the task of raising funds and meetingother requisite needs for starting a college was formed in the same year. The committee succeeded in its tireless efforts in opening the pre-University Arts faculty of Salipur College, Salipur, affiliated to the Utkal Universitywith effect from 9th July 1964. In this connection, special mention may bemade of the munificent donations made by a firm of Contractors through itspartners Sri Biraja Prasad Ray, Sri Baman Charan Parida and a prominentlocal business man Sri Bikalananda Kar in addition to the help and financialsupport by legions of local enthusiasts that helped in materialising the aspirationsof the people of Salipur for establishing an institution of higher learning. In1965 the College was shifted to its present site with a limited accommodationof Pre-University classes in Arts and Science faculties. The first year degreeclasses at the B.A and B.Sc. stages were started in 1965-66 and 66-67respectively. The second and the third year Degree Classes were opened withinthe years that followed. In the year 1970 the first batch of Graduates came outof the College. In the 1970-71 P. U. classes in Commerce and Education classeswere introduced. In 1971-72 B.Sc. classes with Physics, Chemistry andMathematics (Physical Science) group were opened. In 1972-73 B.Sc. classeswith Chemistry Botany, and Zoology (Life Science) group along with B. Comand B.A (Education) classes were opened. In 1974-75 Honours classes in theHumanities were introduced. Honours Courses in Physics and Chemistry wereopened from session 1976-77 and Zoology Hons from 77-78 and Botany Hons.from 1980-81 were introduced. The Vocational subjects such as Electronics at+2 Higher Secondary stage were introduced from 1998- 99 and IFF (IndustrialFish & Fishery) at the degree level have been introduced since 1996-97 underUGC assistance. Honours in Education and Commerce were introduced from1978-79, Honours in Sociology was opened from 2003-2004 and Honours inSanskrit and Philosophy were have been introduced with permanent recognitionfrom 2006-07 vide Govt. Order No. 5592 dated 22.08.06. There has been asteady growth of its students strength. It has increased from 83 in 1964-65 toabout 2779 including over a 1375 girl students in 2010 -2011. The ‘members ofthe academic staff’ that comprised only seven members in 1964 increased to88 including 28 ladies teachers in 2011. The present strength of non-teachingand supporting staff is about 50 in 2011. The College has carved out a niche foritself in the map of premier educational institutions of higher learning in thestate gaining in from strength to strength in academic excellence, inculcatinginto the minds of its young learners a unique sense of discipline, unity, honesty,integrity and accountability. In the present pioneering stature a bright, and clean image of SalipurCollege the aspirations of the local people who have toiled, strived, sweated,sacrificed and dedicated themselves to the cause of diffusion of higher educationand learning have found partial fulfillment. It is now a full-fledged degree collegewith an enviable record of students commendable success at variousexaminations from time to time. With financial assistance from the StateGovernment and the University Grants Commission (UGC) and the ungrudginghelp and patronage from persons of the locality and abroad who count in variouspolitical and Social spheres, this college looks forward to reaching a crescendoof parfection and excellence. Its immaculate ways of conducting examinationat various levels are commendable and serves as a role model and eye-openerfor others. We should not be over taken by self complacency, much remains to bedone to expand its activities and bring it to the status of one of the leadingpremier educational institution of the nation with autonomy. We have to strivehard to maintain and promote its present stature with an unswerving devotionto duty, unchallengeable sense of commitments, involvement accountability,and transparency. This institution celebrated its silver Jubilee a week long function inSeptember 1991 with a great glory in a grand manner. This college celebratedits maiden foundation day on 9th July 2004. Some former principals and seniorteachers were felicitated on this occasion. Members of peer team of NAAC(National Assessment and Accreditation Counsel, an autonomous body ofU.G.C.) Visited this college on 30th November and 1st December 2005 for accreditation. The college has been accredited with an excellent grade of B++with 82.25% for 5 years w.e.f. 2nd Feb. 2006. Score. Our college deity LordLaxmi Narayan were installed in the newly built temple in the college premiseson 31st August 2006. University Grant Commission (UGC) vide its letter no. F.4-345/ 2007Dated 24.02.07 has conveyed its approval for the opening of a career-orientedcourse with 32 seats in Mass Communication and Video Production at its 1stDegree level of +3 with effect from the academic session 2007-08. This coursewas introduced as an addon course along with the conventional +3 B.A./B.Sc.Degree Courses which is just like a parallel course to the existing three years Degree Course. UGC also vide its letter no. F635/2008 dated 20.3.08 has givenapproval for another career-oriented Course in Communicative English with anintake of 32 seats from the academic session 2008-09. Corporate Sector like Infosys, Zen-Pact, Vedanta, Asian Paints etc. Paytheir regular visits to the college to select efficient, meritorious students fornecessary training at their end to have them within their fold.Infosys is pleased to award 40 students of the college Prativa PoshakScholarship during the session - 2009-2010.Campus grooming is being undertaken by the trained teachers throughProject-Genesis Programme launched by Infosys.Bikalananda Kar Memorial Trust Salipur awards financial help tomeritorious students in each academic session at +2 and +3 levels.The Salipur Junior College has come into the fold of e-admission understudent Academic Management system (SAMS) in respect of +2 stream fromthe academic Session 2010-11 vide Deptt. of Higher Educated G. O. No. 84485dated 14.12.2009 and Salipur Degree College has come into the fold ofe-admission in respect of +3 stream w.e.f. The academic session 2011-12 videDept. of Higher Education G.O. No. 6626 dated 22.02.2011.